Beneteau Monte Carlo 6 is a great combination of Italian design and Industrial know how. This boat has all the qualities of a mega yacht. Style, services, comfort, interior and exterior design and built up, the Monte Carlo 6 tops it all and is indeed one of its kind. 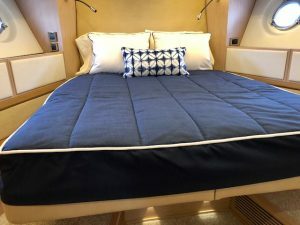 The interior is designed keeping in mind the open space design concept and the top-quality materials and detailed finishes add to the classic beauty of this boat. The master stateroom gets enough natural light from the large windows around the hull. 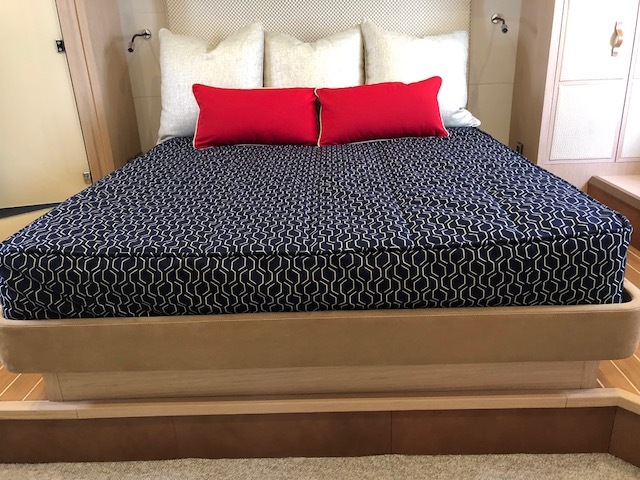 For this client, we designed our custom quilted quilts using sunbrella fabrics. Sunbrella being a performance fabric is widely used these days for indoor and outdoor fabrics. The benefits of using Sunbrella fabrics in comparison to others are endless. It is 100 percent solution dyed acrylic fabric where each fiber is color saturated separately to get a rich color that makes it fade and water resistant. Moreover, sunbrella is mold and mildew resistant, stain resistant, very easy to clean and minimal to no stretching or shrinking. It is because of these super qualities, we recommend sunbrella fabrics to all our clients. Here, are custom quilts in Navy with solid piping gives a clean, crisp look to the beds. 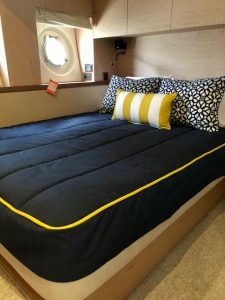 The use of Geo patterned Navy sunbrella fabric in the master stateroom with solid shams and fun throw pillows is adding just the right amount of variety to the bed maintaining the same cool and clean look! The designer has creatively mixed solids with vibrant throw pillows that adds excitement to the whole design yet at the same time maintains the classic look of this MC6. Visit our website to check out our large collection of throw pillows. It is a great mix of nautical designs, fun patterns and rich texture and colors. We make all our products custom to fit the size and shape of your particular boat. Our quilted coverlets are perfect for keeping your stateroom looking tidy and are a breeze while making the bed. A lot of our clients like our custom duvets for their beds. Our custom duvets bring the perfect amount of color and comfort to your bed. Our custom duvets are down alternative, low to medium loft that provide comfort and warmth without the bulk. In short, we have everything and anything you need when it comes to your beds so feel free to contact us so we can make your stateroom, A Statement Room.